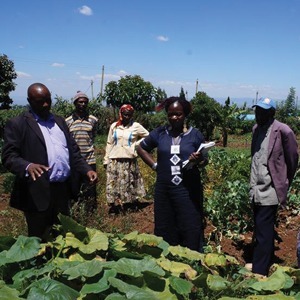 Eunice Wangari is a farmer in Giteru. She is an innovative farmer and practises what she learns. Eunice has introduced some indigenous food crops on her farm and started multiplication of indigenous food crop seeds. Some of the crops she has introduced include pigeon peas, sugar cane, and bananas. She also grows indigenous vegetables that include black night shade, pig weeds, and amaranth. Previously, she used to plant each crop on its own but nowadays she integrates different crops together. She has observed that integrating food crops ensures diversity of food crops while pest infestation and disease prevalence has reduced drastically compared to the mono cropping system. Eunice has integrated livestock into her farming, specifically dairy goats. She recommends goat milk as it is rich in nutrition and is in high demand within the community due to its nutritional value. She gets about two litres of milk in the morning and one and a half litres in the evening from each goat. The goats also support her crop farming through provision of manure. She practises composting within her compound and takes the ready compost to her farm. Composting helps reduce the cost of outsourcing fertiliser and other inputs externally. Eunice has innovatively introduced a live fence of castor oil plants that serve as woodlot within the homestead. Since the castor plants are fast growing, she initially sourced some seeds from another farmer and planted them along the boundary. The castor plants did very well and within one year they were big enough to produce firewood. It at this juncture that she realised she could be using the castor trees for firewood and devised a method of cutting off the branches so that they can wither and dry. Since the castor plants usually have mature seeds, they fall and germinate and introduce a succeeding live fence and hence her supply of wood fuel is sustained this way.